The load-displacement behavior of the plain bearing is calculated according to (ISO 7902-2, May 1998). Therefore, the ratio of width to diameter is restricted to . 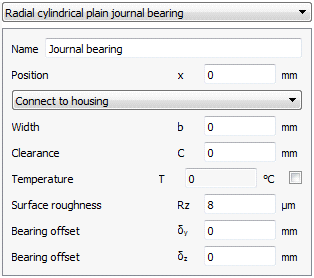 The parameters used for the definition of this bearing type are shown in the enclosed figure. Clearance represents the total diametric operating clearance between the journal and the bearing. Any eccentricity is introduced through the corresponding offset inputs in y and x direction. The optional temperature input does only affect lubricant viscosity. It does not affect clearance. Surface roughness is the average between the shaft and the bearing and it is used to calculate a minimum required film thickness. The outer ring of the bearing can be connected to either the housing or another shaft. For modal analysis the unsymmetrical stiffness matrix of the plain bearing is replaced by two orthogonal springs, because of limitations of the FEA library. Therefore, any natural frequencies are an approximation only. No stability analysis can be performed with this software. Damping is not considered either.